I am going to show you a study which will blow your mind. A study that shows, in plain English, that our coveted mammograms just don’t work. I am going to contend that mammograms are a big, for-profit, machine that do nothing to help women evade the dark clutches of cancer. Mammograms are almost the medical world’s most no-brainer ritual. If you are diagnosed with breast cancer and are found to have never received a mammogram, you are almost surely to be considered a woman who got what she had coming to her. It’s the sad fear-based marketing that puts breast in the machine, money in the machine maker’s pockets – with women being left out in the cold with an ineffective expenditure and false sense of security. First, let’s begin with a study which occurred over 1 year ago. This is based on a 25-year-old follow up on breast cancer incidence and mortality of the Canadian National Breast Screen Study. So what were the results and the conclusion? Results During the five year screening period, 666 invasive breast cancers were diagnosed in the mammography arm (n=44?925 participants) and 524 in the controls (n=44?910), and of these, 180 women in the mammography arm and 171 women in the control arm died of breast cancer during the 25 year follow-up period. The overall hazard ratio for death from breast cancer diagnosed during the screening period associated with mammography was 1.05 (95% confidence interval 0.85 to 1.30). The findings for women aged 40-49 and 50-59 were almost identical. During the entire study period, 3250 women in the mammography arm and 3133 in the control arm had a diagnosis of breast cancer, and 500 and 505, respectively, died of breast cancer. Thus the cumulative mortality from breast cancer was similar between women in the mammography arm and in the control arm (hazard ratio 0.99, 95% confidence interval 0.88 to 1.12). After 15 years of follow-up a residual excess of 106 cancers was observed in the mammography arm, attributable to over-diagnosis. So after 25 years, the results of women who got mammograms and those who didn’t were almost exactly the same in terms of those who died from breast cancer. That’s as clear of a study as there ever could be. But then why, if this study has been out for over a year, would anyone remain a believer in the mammogram? Breast cancer awareness month. This movement is huge. They even provide hosting for women in need to get mammograms. Any time we see charitable organizations dishing out “medical advancements,” we are subconsciously subjugated into believing that if we also don’t do the same, we are pompous and unfazed of our blessed lives. Breast cancer awareness month now has the support of the NFL. Which means they now influence men to persuade women into getting mammograms. The NFL is one of the largest TV contracts in the history of the world. Its influence is immeasurable. They change the player’s uniforms and cleats. They do promo spots. In addition to the NFL, all major television talk shows are involved in the campaign. It is a month of inescapable marketing. What’s worse? The NFL campaign doesn’t fund breast cancer cures, it funds breast cancer marketing! This is how it works: The NFL donates proceeds from its awareness campaign, auctions, and the NFL Shop to the American Cancer Society (ACS), which in turns uses that money to increase awareness, education, and screenings for women over 40. The study you just read above threatens the mammogram revenue machine. Just think about it for a moment, the volume of women getting mammograms; the absurd amount of profits from those visits. That’s not something that the mammogram industry intends to lose. But hopefully women can begin to share this information with other women and counter the mammogram marketing beast which for now, presides over us all. Breast thermography is a radiation free way to look for issues inside of the breast region. Of course, we hear little about it. In fairness, it isn’t available everywhere (but that’s probably part of the overall protection of mammogram profiteering). 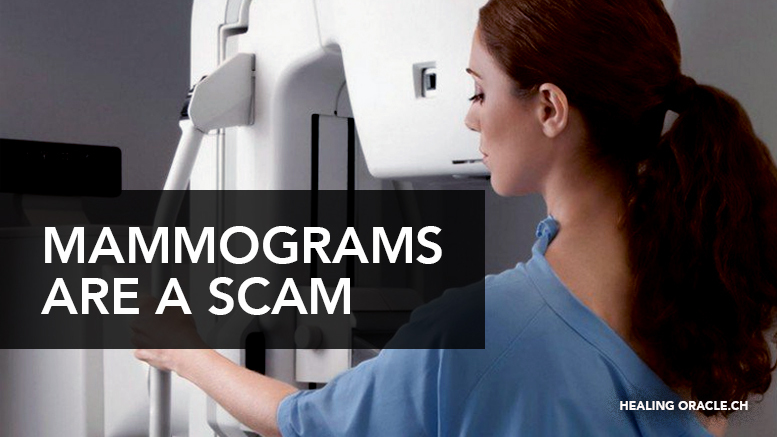 Be the first to comment on "MAMMOGRAMS ARE A SCAM"